The Digital Phoenix Project was a multi-disciplinary, collaborative project at ASU funded through a grant in the Herberger Center for Design Research. It involved professors and graduate research assistants from the Schools of Urban Planning, Computer Science, Architecture, Design, Engineering, Geography, and the Decision Theater. 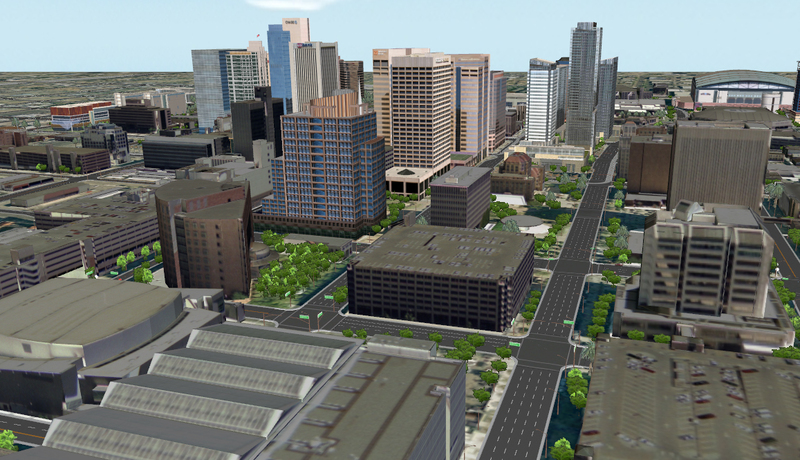 The main goal of the project was to create an interactive 3D city model to visualize past, current, and future issues about the development of the downtown core. These issues include urban sprawl, new building development, population growth, traffic congestion and flows, employment rates, and preservation of water and habitat. 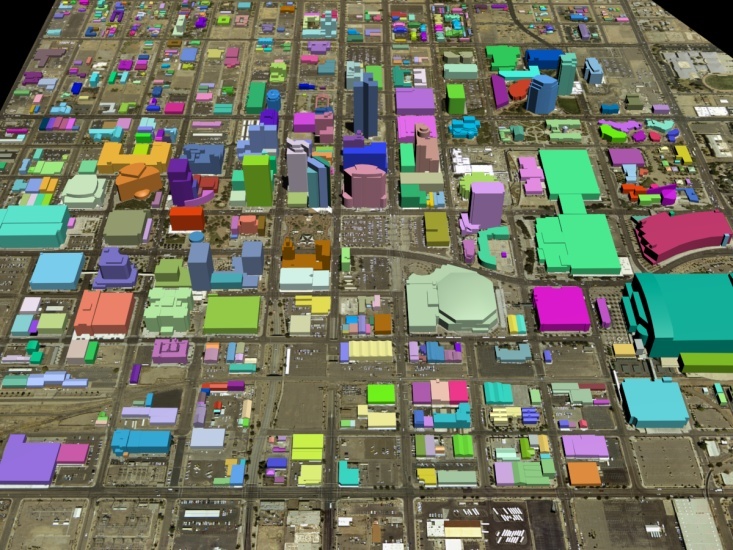 The project was two faceted: a micro-simulation of a 1×1 square mile, interactive 3D model of downtown Phoenix; and macro-simulations of digital scenarios based on a database of city statistics, such as population, transportation, employment, water consumption, and energy use. I was a part of the small 3D-modeling group, spearheaded by Professor Yoshihiro Kobayashi of the College of Architecture. 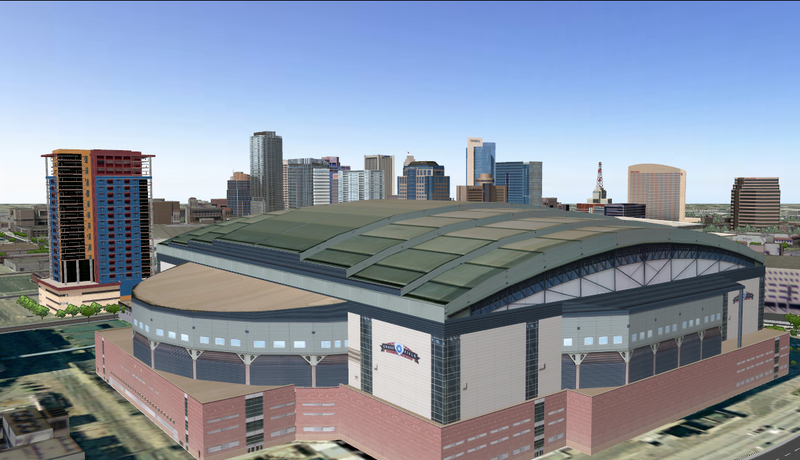 Our three-man design team used an innovative combination of 3D software to produce the initial downtown core of over 500 buildings. Due to the strengths of the combined software tools, we were able to complete this initial modeling phase in about a week’s time. A model of this magnitude can take months to create. We used 3DStudioMax (for buildings and assets), Nverse Photo (a max plug-in utilizing photogrammatrey for quick city generation), and Forum8 LTD’s UC-Win/Road (a real-time interactive VR environment used for road and terrain creation and traffic simulation). After the buildings and terrain were created, we continued to accurately model lane conditions, traffic signals, intersection textures, street signs, stop signs, and foliage. 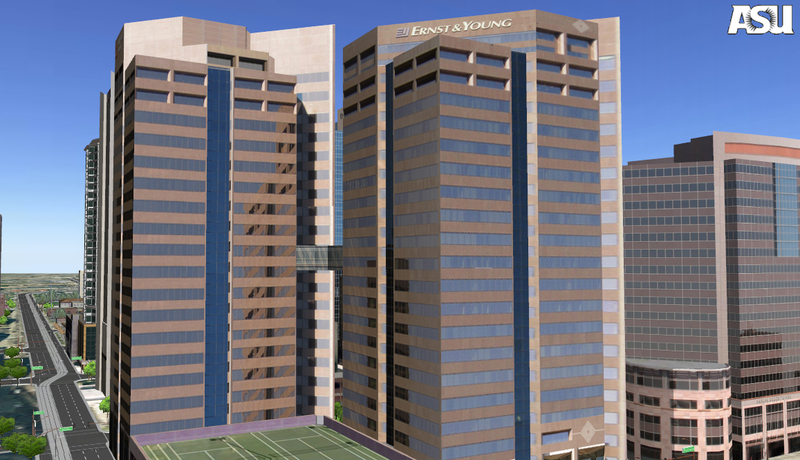 Over time, we began to model future development based on city planning and architectural drawings, including a working light-rail model and new skyscrapers to visualize the impact to the Phoenix skyline. The model debuted at ASU’s Decision Theater in the fall of 2006, and has since been shown many venues around the world. 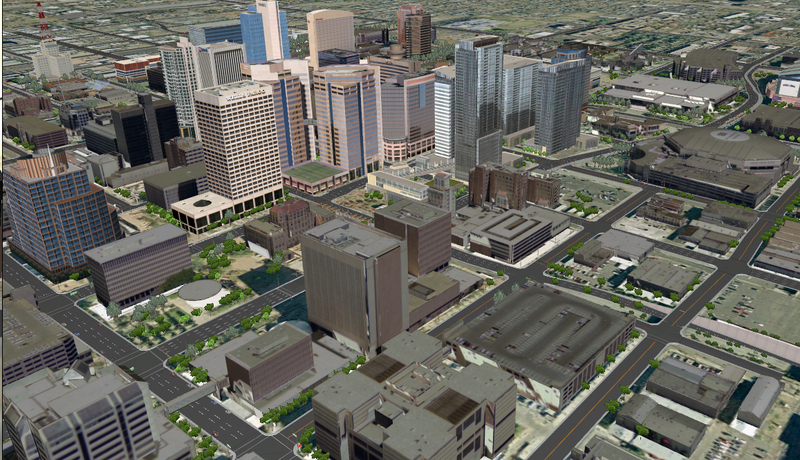 It was exhibited at Siggraph 2007 in San Diego, used as an opening animation sequence for Phoenix Mayor Phil Gordon’s 2008 State of the City address, and won two awards at the Forum8 VR Design festival in Tokyo in 2007 and 2008. 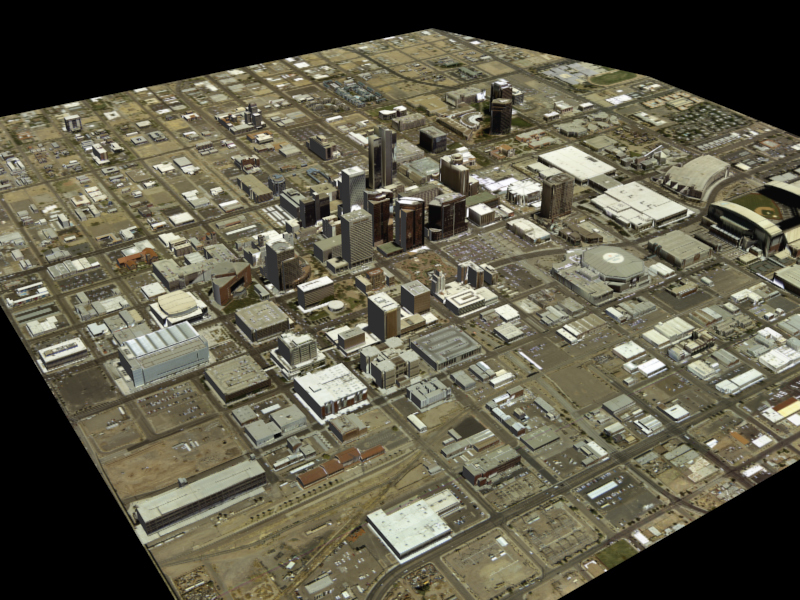 The Digital Phoenix model was used as a base VR model for the Desert Temporary Urban Land Infill Project (TULIP) in 2009. 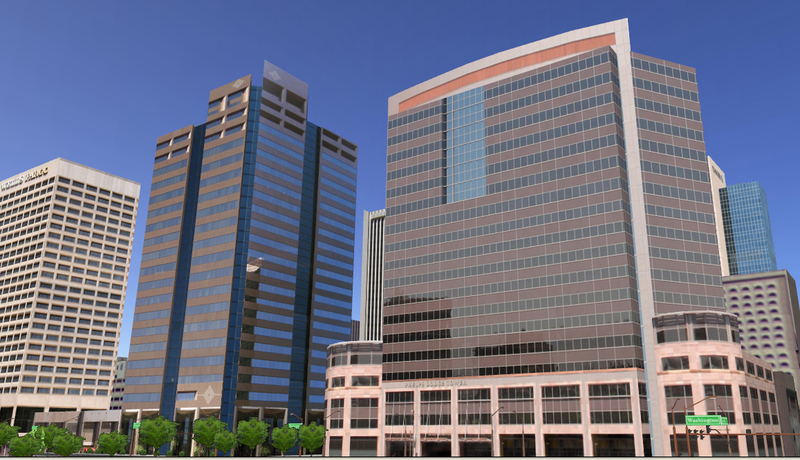 Desert TULIP is a student-led program at the Phoenix Urban Research Laboratory with the goal of temporarily transforming Phoenix’s abundant vacant properties into vibrant assets prior to future development. The versatile model was also used in conjunction with a driving simulator to test the gas and braking habits in an Eco Drive study, which was published in the 2010 Symposium on Simulation for Architecture and Urban Design.